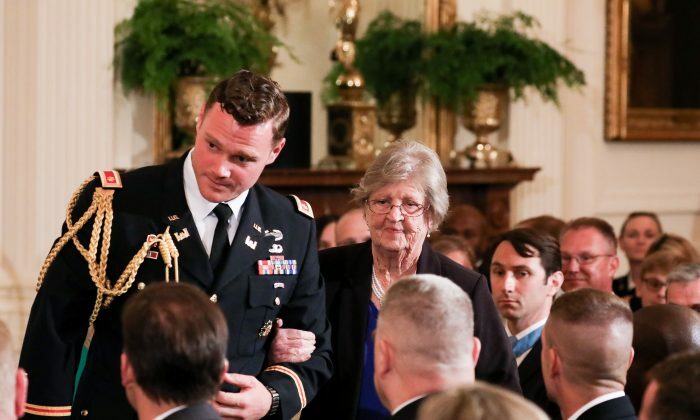 WASHINGTON—A hero was saluted at the White House on June 26 as his widow accepted a posthumous Medal of Honor. Pauline Conner, 89, accepted the military’s highest honor on behalf of her late husband for his extraordinary bravery during World War II. On Jan. 24, 1945, Army 1st Lt. Garlin Murl Conner, who had already spent more than two years on the front lines, was laying in an army field hospital in northern France after sustaining a hip injury—the latest in a string of injuries that hadn’t kept him down for long. Conner was scheduled to be sent home after he had healed sufficiently. But he had other ideas. Conner took the field telephone and headed toward the enemy. Conner spent three hours directing artillery fire from a shallow ditch, 30 yards in front of the American line, while bullets rained around him, Trump said. “In front of the lone American soldier were six German tanks and hundreds of German soldiers,” he said. The enemy got within five yards of his position. It worked. The Germans retreated, and miraculously, Conner survived. “Those people that were with him, many of them now gone, said it was the single bravest act they’ve ever seen,” Trump said. Conner returned home a hero and his hometown held a parade—which is where Pauline first saw him. Also attending the ceremony were Conner’s son, four grandchildren, and four great-grandchildren. Conner grew up on a farm near Albany, Kentucky, as one of 11 children. “He grew up during the Great Depression and dropped out of school after the 8th grade to help provide for his family,” Trump said. 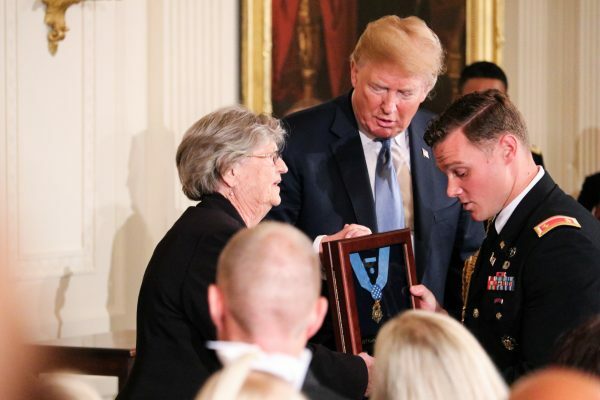 Since he took office, Trump has presented three other Medals of Honor to war heroes—two of whom attended the ceremony for Conner. The Congressional Medal of Honor was introduced in Congress in 1861, and signed by President Abraham Lincoln late that year. The first award was made to Pvt. Jacob Parrott on March 25, 1863, according to the official website. A total of 3,502 medals have been issued, including 19 double recipients. President Donald Trump paid a Memorial Day tribute at Arlington National Cemetery on May 28.